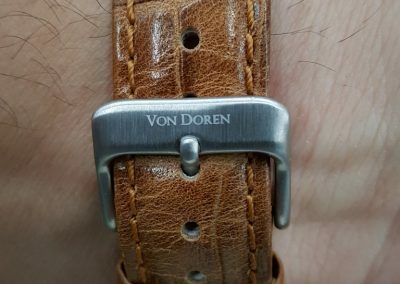 Von Doren is a Norwegian watch company founded by Von Doren Asbjornsen. 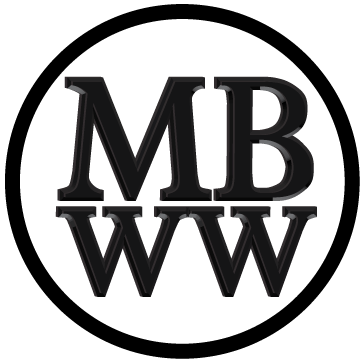 It began on Kickstarter on December 14, 2016, and as a new company they have really taken off. Four watches are offered under the model name Aksla, named after Mt. Aksla, which overlooks the town of Aalesund. Located on the West coast of Norway, the city is known for it’s Art Nouveau architecture. When the wood structure town was virtually destroyed by a devastating fire in 1904, over 50 architects came in to help in the rebuilding. Art Nouveau was very popular at the time and was the style chosen for the rebuilding in brick and mortar. The architecture of Aalesund was an inspiration for the design of this watch. For this initial run of 480 watches, four versions of the Aksla are being offered; gold case with frost white face, stainless steel case with midnight sun yellow face, rose gold case with pure black face and for this review, stainless steel case with antique white face. 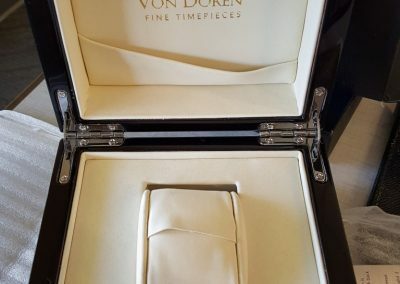 The watches are 42mm in diameter (without the crown) by 10.9 mm thick (6 mm for the case, 2 mm for the screw down case back and 2.9 mm for the crystal) with 20 mm between the lugs and 48 mm lug to lug. 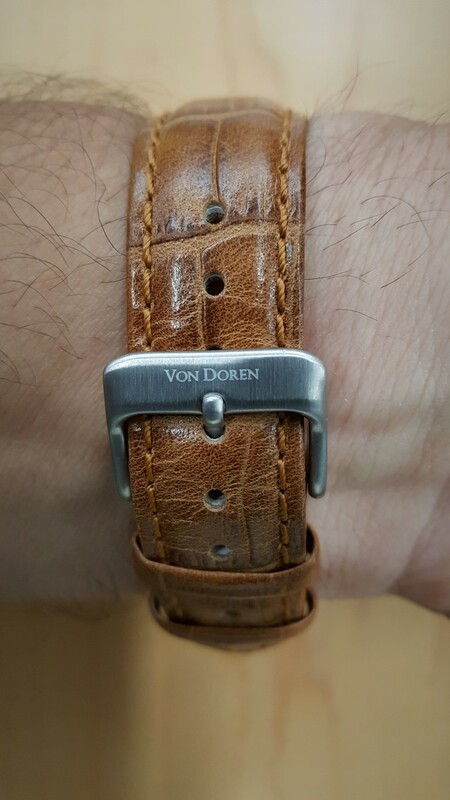 The 20 mm Italian brown sandalo leather alligator finished strap is sized to fit most wrists and has a brushed signed stainless steel buckle with two loops with quick release, a handy feature I have not run across very often. The 316L brushed stainless case has a somewhat saucer or bowl shape in profile with a raised double domed sapphire internal anti reflective crystal. Complementing the design is a perfectly sized 5.5 mm by 2.75 mm brushed stainless signed flat top gear edged crown that tapers where it meets the case. Four substantial turned down beak shaped lugs and the raised case back keeps the watch snug on my 7 inch wrist without any rubbing of the crown. 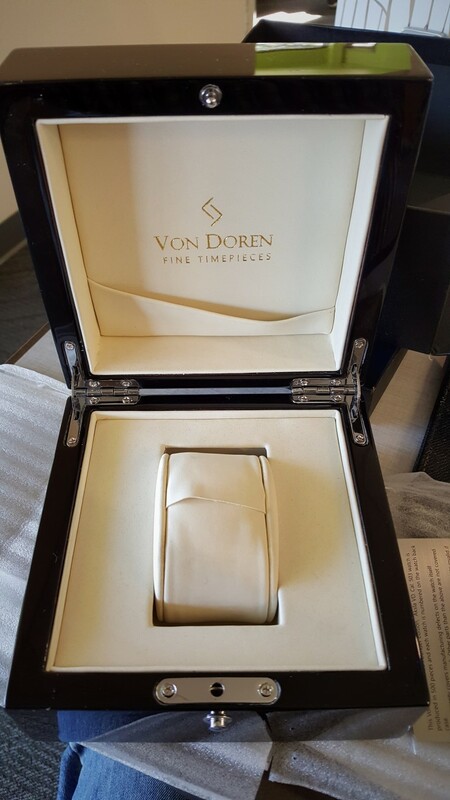 The case back is very tastefully engraved with the brand name, logo and information about the watch. The watch is rated 5 ATM/50 meters for water resistance. The face of the watch is a minimalistic design of four double line markers for 12, 3, 6 and 9 o’clock and eight single line markers for the 1, 2, 4, 5, 7, 8,10 and 11 o’clock. 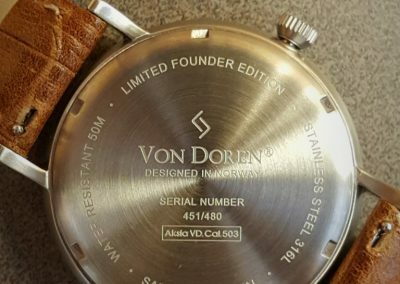 Only the logo and brand name are on the upper half of the face and the words “Swiss Movement” at the bottom of the face slightly shortening the two double line markers. The hands all have a very nice almost irredescent blue finish. The lumed thin hour hand is complemented by a lumed minute hand and a very thin taperd second hand. I really like the look of this watch face, particularly the way the crystal makes the face look like it is curving downward where the face meets the beveled edge of the case. Powering this watch is a Swiss Ronda Powertech 503 quartz movement. 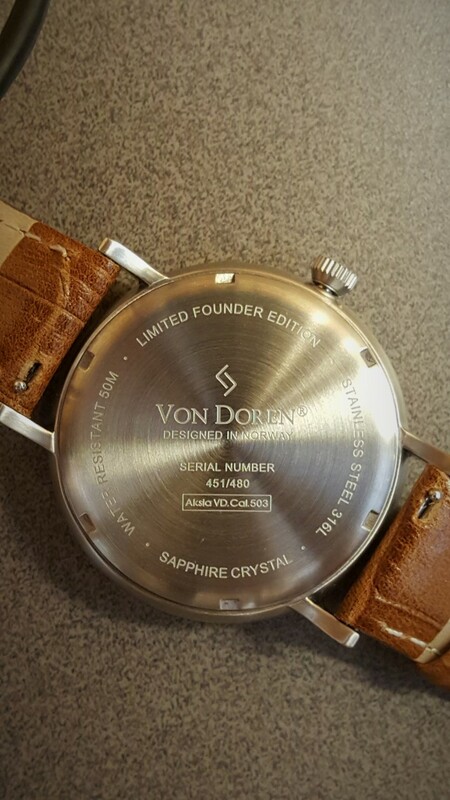 The movement has 1 jewel and has a battery life rating of 45 months. My example has been less than a second a day fast. 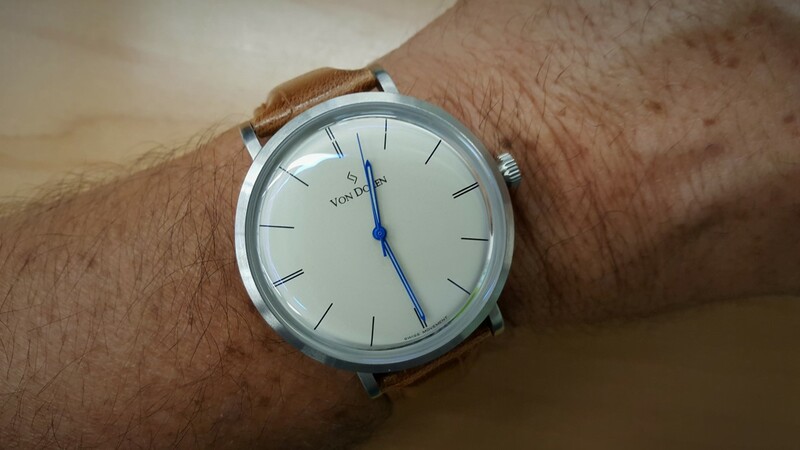 On this particular watch, the second hand lines up on the watch face better than any other quartz watch I have seen so far. 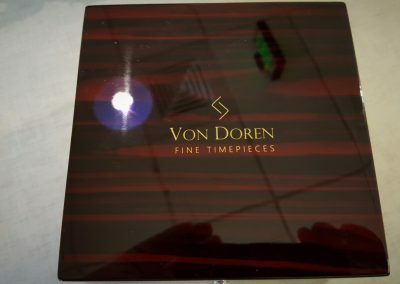 As a minimalist quartz dress watch, the Von Doren Aksla is a great one in my opinion. 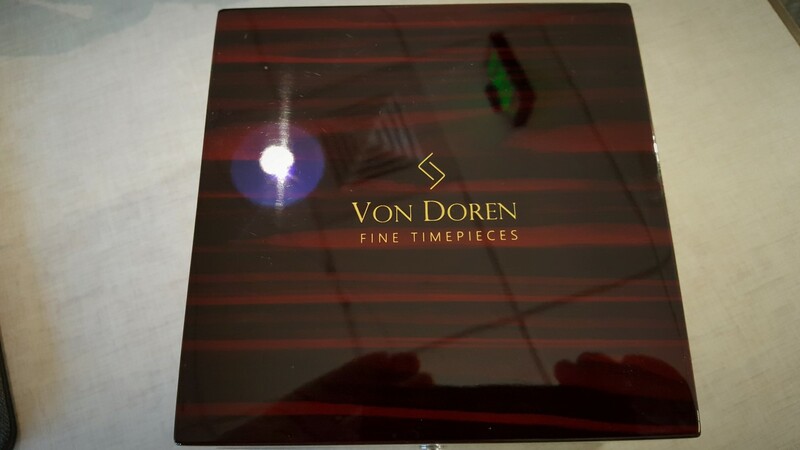 It has all the qualities I admire in this type of watch except for one; they are almost sold out with only a total of only 480 being produced in all four finishes; my example is number 451 of 480. Thank you. We are indeed very happy with the design and quality and of course all the positive feedback. Classic styling. Quality build. And the second hands line up with their indicators.